The Lenco PlayConnect is a device that you can use to connect your existing stereo system to your home network. It can work on its own in this fashion, or it can be used as part of a multi-room sound system with Lenco’s wireless speaker products (the PlayLink4 and PlayLink6). It’s a box that has essential physical connections on it, such as Ethernet, optical output, RCA output, and line in, and it also includes dual-band wireless networking. While it works well as a device to bring your stereo online, allowing you to play music off any device that has the Lenco app installed (this is your main control interface for the product), a drawback is that it doesn’t include Bluetooth. To use the PlayConnect optimally, you must have a home network, though you can also take advantage of Wi-Fi Direct from a phone, tablet or laptop, bypassing a router. Setting up the PlayConnect is a matter of connecting it to your stereo’s amplifier, either via the RCA ports or the optical port, and then using WPS (Wi-Fi Protected Setup) to connect it to your wireless router. It is essential that your router supports WPS; press the button for WPS on your router to put it in discovery mode (or enable it through the router’s Web interface) and then press the WPS button on the Lenco PlayConnect to marry the devices. You could also use the Ethernet port to connect the Lenco to your router, though this means having your router close enough to your stereo so that the audio cables can also be connected. Using Ethernet is advantageous if you will be running the PlayConnect in a multi-speaker environment to help you go easy on the wireless bandwidth, though you could also use 5GHz Wi-Fi, if your router supports it, for faster wireless throughput. The Lenco PlayConnect is said to support the playback of high-resolution files up to 24-bit/192kHz, good if you're a budding audiophile, though the playback of HD files is down-sampled to CD quality when run through the optical connection so that it's compatible with more mainstream stereo equipment. In any case, high-resolution music isn’t that easy to come by in Australia, depending on your musical taste, but a site such as HDTracks can be used to see what’s on offer. Unfortunately, regional restrictions that prohibit buying certain albums in Australia mean that you might not be able to buy the music you want. Other ways to get high quality (but not high-resolution) music playback include ripping your own CDs as FLAC files rather than MP3s, and downloading independent music as FLAC files if they're offered. Files can be played through the Lenco PlayLink app to your connected stereo system. 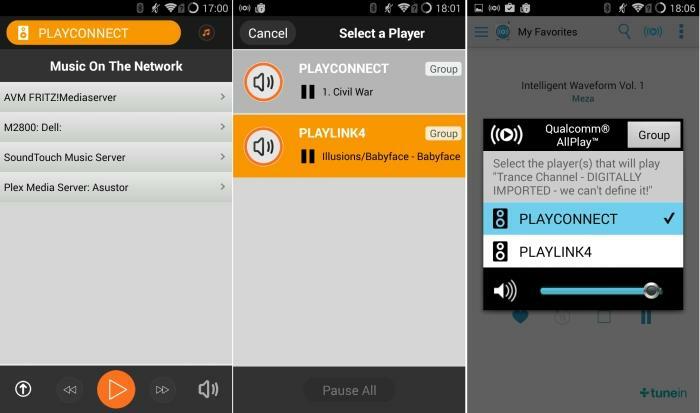 The PlayLink app can see music that’s stored directly on your phone, or music that’s stored and served from network devices, such as a NAS box. We used a NAS box running the Plex Media Server, which contained a library of our music, and the app played files from there without any issues. Supported file types are MP3, FLAC, AAC, PCM, WAV, and ALAC. Lenco PlayLink app. From left to right: finding music located on the network, using the PlayConnect as part of a multi-room system, sending music from AllPlay Radio to the PlayConnect. The Lenco PlayLink app supports the Qualcomm AllPlay specification, and is actually built on the AllPlay Jukebox app, just skinned with the Lenco branding. While it can be used to play all the FLAC and MP3 files you have stored locally, it can also be used to play online streams. Spotify is the main popular service that’s featured for streaming, as it, too, supports the Qualcomm AllPlay specification. You simply launch the Spotify app through the Leno app, and then select the output for your music, which would be the PlayConnect device that it detects. What we love is the AllPlay Radio app that can be used to play a plethora of online music streams from all over the world. In particular, we enjoy the inclusion of Digitally Imported stations through this service -- it’s a must-listen if you love electronic music. Not all content can be played on your stereo through the Lenco PlayConnect. Apps such as Google Play Music and Bandcamp, for example, aren’t supported. The lack of Bluetooth means you can’t just play these services from your phone -- you can only play services that support the AllPlay spec. If it had Bluetooth, you could turn your stereo into a massive Bluetooth speaker system and play anything you want, and we feel like this is a missed opportunity for the PlayConnect. That said, the Lenco PlayConnect is still a great way to get your home stereo online so that you can play files from phones, tablets, NAS devices, and computers that are on the same network. Since it forms part of Lenco’s multi-room PlayLink ecosystem, you can use the Lenco app to play music through the PlayConnect, and through other speakers such as the Lenco PlayLink4 and PlayLink6 -- any other brand wireless speakers will also work if they support the Qualcomm AllPlay specification. In a multi-room set-up, you can play different songs on the speakers that are located in different areas in your home, or you can group them so that they all play the same song.